Love this Groupon Deal! Buy a $20 Groupon to spend at Old Navy and pay only $10! Old Navy is great for those matching holiday PJs among other cute things! So why not save 50% on this Groupon to buy them?! This deal is only available via Groupon through Sunday! Limit 1 per person, may buy 1 addt'l as a gift. Limit 1 Groupon per visit. Purchase of Groupon may take up to 24hrs to process. 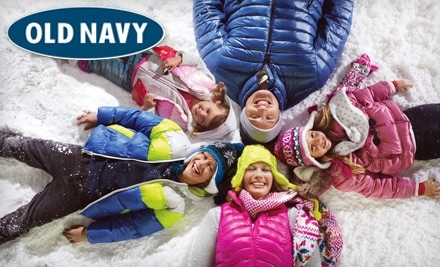 Valid from 11/26-12/24/11 at US Old Navy Stores only. Product restrictions apply. Not transferable. Not valid for cash or cash equivalent. $20 minimum purchase required at Old Navy. Good for $20 of merchandise: $10 Paid For value (never expires) plus $10 Discount Offer value (expires 12/24/11).